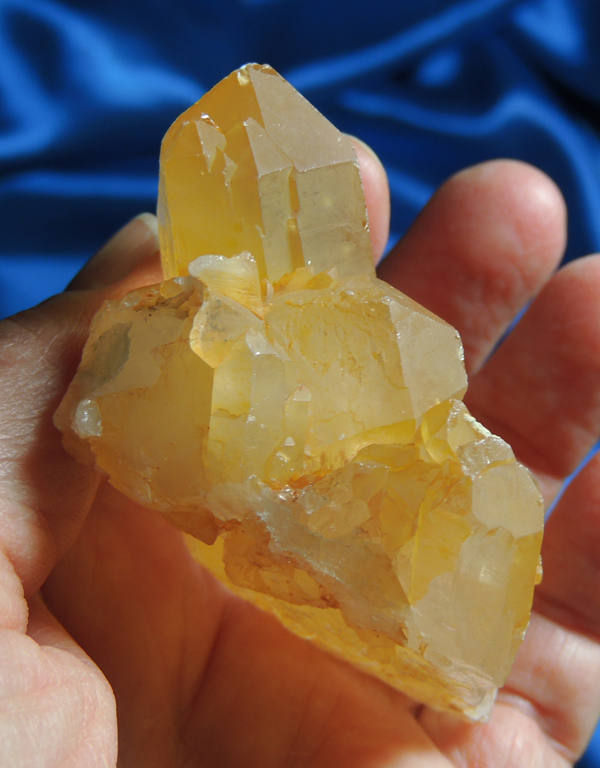 This is an awesome 3 oz 2.4” by 1” by 0.9” tangerine quartz cluster of a single large crystal and a host of students from Brazil. There are subtle Lemurian lines as well as a bit of iridescence in areas. Her coating is slightly golden: the tangerine color is due to hematite, but the golden glow is due to a light coating of iron oxide largely in the crevices between the crystals – she has Golden Healer properties! There are a few little dings, but nothing worrisome at all – she is a beauty to behold! This is a wonderful Spirit – just teaming with vibrancy and charm! She has a sweet nature and exudes joy and energy! Some call the tangerines ‘muse’ crystals and in a sense, they truly are. They allow you to focus on what you are passionate about in your heart and then put it into physical expression. These are wonderful crystals for artists, writers and anyone in creative fields. But this Spirit has a special mission. There are those who are passionate about healing, and for those people, this is their Crystalline Muse! Her Golden Healer coating permits a new approach to healing where the practitioner can step outside convention and looks at diagnosis and treatment in a new and creative way. Just because three people have colds doesn’t mean that they must (or should) be treated the same way. Taking a truly holistic approach, the creative practitioner considers all aspects: physical, emotional and Spiritual in crafting the treatment plan. This Muse is an able and willing partner in that healing process, stirring your imagination and setting your instincts free!